Please see FAQs prepared by Staff regarding shared bike arrow markings or “sharrows” in Kidd Springs. Please let me know if you have any questions. The FAQs below were prepared by City Staff. 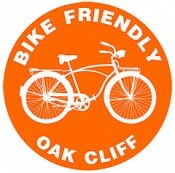 We are also in the process of preparing additional maps showing bike facility development in North Oak Cliff. Thank you for your continued support for more bike facilities in our community. 1) Why was 5th St selected for an east-west route in this area? The 2011 Dallas Bike Plan identified multiple bicycle routes in the Kidd Springs Park area, specifically on Bishop and Zang. The Bishop Ave. bike lane is already complete from Colorado to just north of Davis. The proposed bike route on Zang will extend from Greenbriar to 5th Street. The shared lane markings were added to 5th Street to facilitate a marked connection between the bicycle routes on Zang, Bishop and to Kidd Springs Park. 2) Was the surrounding neighborhood given an opportunity to provide feedback on the selection of 5th Street for the sharrows? Bicycles are allowed on all City streets and the addition of the shared lane markings (sharrows) does not change the operational characteristics of the street. The shared lane markings only serve to emphasize the shared nature of all streets and to create connections between other bicycle facilities. Since the addition of sharrows does not change the existing conditions of the street (number of lanes, on-street parking, etc) public meetings are not held when those types of markings are installed. This is also true for other street restriping projects that do not make changes to how the street functions. 3) More generally, was the placement of these markings and the broader system of bicycle facilities well-publicized for affected communities to review? On April 3rd, 2013 the City Council was briefed on the status of the Dallas Bikeway System, including a map of bicycle routes to be installed within the next few years. This map included the addition of 5th Street as a planned route. The briefing can be reviewed through the following link. During the development of the 2011 Dallas Bike Plan, multiple meetings were held to gather public input on proposed routes. The City is also trying to develop an education campaign to inform all citizens on the different bicycle facility types and what they mean for both drivers and cyclists. City staff recently applied for State funding to develop such a program but unfortunately it was not selected for funding. The North Central Texas Council of Governments is working to develop a regional educational program on bicycle awareness and the City will closely coordinate with that agency for the use of their materials. City staff are also in the process of developing a Bicycle Advisory Working Group of Dallas Citizen interested in promoting the City’s bicycle programs. This group, once developed, will help with items such as advocacy, outreach, education, and fundraising to help support the bicycle program. If this is something you might be interested in, please let me know and we can discuss what this group would do and what may be required of those serving on it. i don’t have a problem w/ sharrows on 5th (the more the better), but for east to west commuting through 75208, i think that sharrows should be on canty if we’re trying to efficiently allocating bike infrastructure resources. it is wide and connects the west neighborhoods to the bishop bike lanes and then to the jeffereson cycle-track for daily commuting (i.e. my commute). 5th st runs straight into Kidd Springs Park, but Canty keeps going. it is necessary that the bicycle riders have maximum security. proper road plans needs to be put and come up with some acceptable projects which includes individual’s safety. hope this plan gets maximum people’s response for the further proceedings. Is anyone else interested having the City of Dallas change the law? I propose the City provide DEDICATED BICYCLE LANES and END the sharing roadways with 2 ton+ vehicles and bicycles. A cyclist has no chance against an accidental collision with a car/truck. “Sharrows” are fatalities waiting to happen. Cyclists need dedicated bike lanes free from motorized traffic.